During the preparation of AMD Ryzen Threadripper processors for the announcement, we managed to study the bundle of boxed products, to study the composition of sets of reviewers with "numbered" souvenir mock-ups, but Japanese stores, according to the site AKIBA PC Hotline , are ready to outdo competitors in exotic ways to attract customers to night sales Ryzen Threadripper, which will start today at 22 pm Tokyo time. 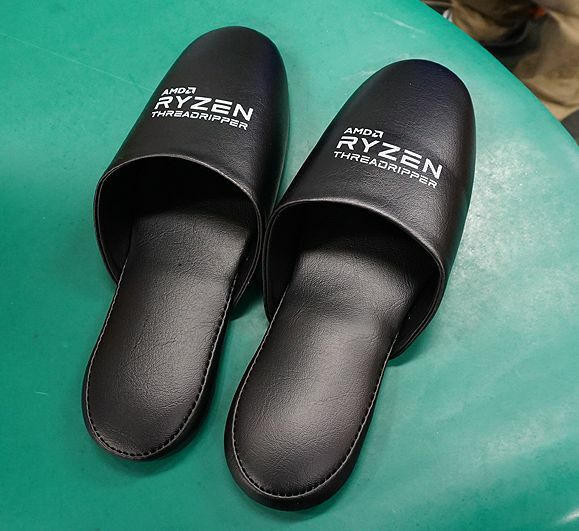 One of the stores in Japan is ready to give the first buyers of AMD Ryzen Threadripper processors slippers with the company logo. Apparently, this amateur activity of the local souvenir industry, since even in neighboring shops such an accessory will not be offered. But individual stores in Japan will start accepting orders as early as eight in the evening, and for those who are suffering to buy Ryzen Threadripper, a demonstration of the capabilities of the new platform and an electronic queue will be organized. On the shelves already not only compatible with Socket TR4 liquid cooling systems, but motherboards with the appropriate connector.